Site Name: ‘CLIFF HOTEL’; ‘GWBERT INN’. In 1851 Esther Davies, 71, inn keeper, still lived here with Mary Peters, 45, house-maid. By that date, the property was the ‘Gwbert Inn’. Esther Davies died in 1851. 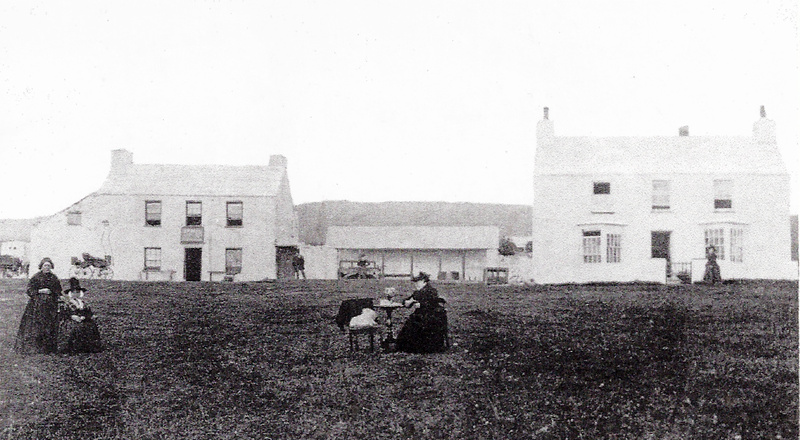 In 1861 the ‘Gwbert’ was occupied by Samuel Jones, 48, farmer of 14 acres, and Phoebe Alban, 27, house servant. The following persons lived here in 1871: Mary Jones, 47, widow, keeper of Public House; Mary Jones, 19, her daughter; Sarah Bowen, 22, daughter, sailor’s wife; Margaret Peters, 60, house keeper; and Elizabeth Davies, 19, house servant. In 1871-78 the publican was Mary Jones. On 19th May 1876 ‘The Gwbert’ was opened – perhaps a new inn on the older site? ‘The Gwbert House’ was advertising holiday accommodation nine days later. On 19th July 1878 Mrs. Mary Jones acquired a lease of the ‘Fat Ox’ inn, No. 2 Pendre, Cardigan. By 2nd May 1879 William Harper owned the ‘Gwbert’, but advertised it to let. In 1879-82 William Harper lived here. In 1881 the following persons lived here: William H. Harper, 31, mariner; Jane Harper, 30, wife; and Sophia Jenkins, 15, domestic servant. On 15th February 1882 a daughter was born to Mr. & Mrs. William H. Harper of the ‘Gwbert Inn’. On 1st June 1883 ‘The Gwbert’ was advertised for sale. It was advertised to let on 6th June 1884. On 24th April 1885 Griffith James advertised ‘The Gwbert’ to let. It was advertised to let again on 11th June 1886. On 8th March 1889 the property was advertised for sale. By 28th June 1889, 30 building plots had been made available at Gwbert, which was ambitiously (and rather over-enthusiastically) declared “The New Brighton” in September. On 11th October 1889 the foundation stone of the first new house was laid. It was proposed to extend the old ‘Gwbert Inn’ to create a hotel, with plans supplied by Richard Thomas of the Cardigan Brickwork Company. The new ‘Gwbert Hotel’ was officially opened on 13th June 1890 and the new Gwbert development was declared open on 4th July 1890 by Mrs. Morgan-Richardson of Noyaddwilym, Llangoedmor, who was presented with a silver key on that occasion. In 1891 the following persons lived here: David Williams, 50, hotel keeper; Rachel Williams, 55, wife; Thomas Evans, 24, stepson, medical student; Martha Evans, 26, step-daughter; Hannah Evans, 23, step-daughter; Elizabeth Evans, 22, step-daughter; Sarah Howells, 34, cook; and William Davies, 11, stable boy. 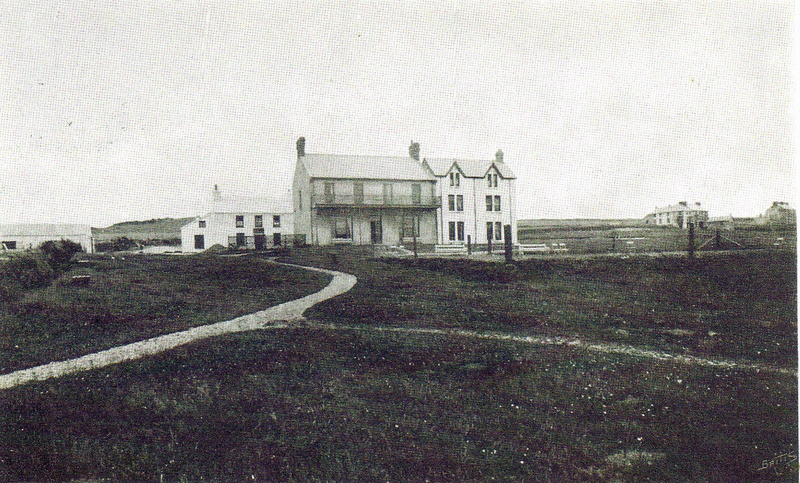 On 9th January 1894 the license of the ‘Gwbert-on-the-Sea Inn’ was transferred to Rachel Williams. On 16th April 1896 the Gwbert Golf Links opened, the “Cardigan & Tivyside Golf Club” having been formed in January of that year. On 5th January 1897 plans were afoot to demolish “the Cottage” adjoining the hotel, to build a new residence. A new road over the burrows was also proposed. On 4th March 1898 it was proposed to pull down the old ‘Gwbert Inn’ in order to extend the new adjacent hotel. The 1898 alterations to the building were conducted to plans by George Morgan, architect, Carmarthen. On 7th April 1899 tenders were sought for building two new wings. That year, Mrs. Rachel Williams was still the landlady. The golf links were said to be rarely used and very neglected at that time, and were succeeded by a new course in 1902. In 1901 the following persons lived here: Rachel Williams, 64, widow, hotel proprietor (b. Narberth, bilingual); Sarah Howells, 43, cook (b. Llanstephan, bilingual); Anne Garnett, 19, dairy maid (b. Cardigan, Welsh-speaking); and William Davies, 62, agricultural labourer (b. Ferwig, Welsh-speaking). The new extension to the hotel had been completed on the site of the cottage by 5th June 1902. On 16th March 1904 a clearance sale was held for Mrs. E. L. Williams of the ‘Gwbert Hotel’, who was leaving. On 21st February 1905 a daughter was born to Mrs. E. L. Williams of the ‘Gwbert Hotel’. On 16th May 1906 the old ‘Gwbert Inn’ was gutted by fire. On 1st February 1907 extensive renovations were proposed – the old inn was to be demolished, and the hotel extended over the site. Tenders were sought on 15th February 1907 for the extensions, to include 28 new bedrooms and a dining hall, to plans by Lewis Lewis of Cardigan. The owner, Ned Williams, died on 6th June 1907, aged 45. On 3rd September 1907 the license was transferred to his widow, Mrs. Williams. On 13th March 1908 tenders were sought for further renovations for new owner George S. Smith, to plans by Lewis Lewis of Cardigan. 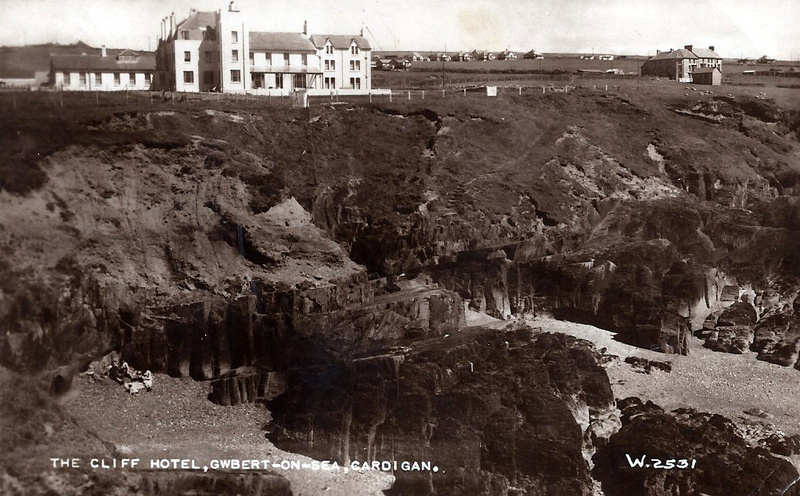 On 5th March 1909 the ‘Gwbert Hotel’ changed its’ name to ‘The Cliff Hotel’ and re-opened on 2nd April 1909, remodelled and extended. Internal furnishings were by Maple & Co. Ltd. of London. George Smith was the owner and Mr. & Mrs. Potter were the managers. On 23rd September 1909 the ‘Cliff Hotel Silver Golf Challenge Cup’ was made. In 1910 the hotel and golf links were sold to George S. Smith. On 31st January 1911 there was an attempted burglary at the hotel. In 1911 Elsie Louisa Cornish of the ‘Cliff Hotel’ began to attend Ferwig School. On 31st May 1911 nearly 2000 children attended a pre-coronation festivity here. On 2nd July 1911 owner George S. Smith died. In February and April 1912 a temporary transfer of the license was granted to Mr. T. C. Baldwin, succeeding Mr. Potter. The 45 bedroom hotel with 14 stall stables, 2 motor garages, and 100 acres, was advertised for sale on 14th March 1913. Messrs. James Howells (store-people) of Cardiff, acquired it for £3500. On 6th March 1914 extensive renovations were proposed, including electric lighting. On 3rd October 1914 a German working here was arrested and taken to an internment camp. In June 1918 Mr. & Mrs. Thristle were the landlords. The 37 bedroom hotel and golf course were advertised for sale on 14th March 1919. On 13th January 1922 the hotel was considered as a possible site for a T. B. hospital. In July 1922 the license was transferred from Mr. Eddyvean to Douglas Everard. The hotel manager was A. P. Harrison in 1923-26. In 1926 Howell Brothers were the proprietors. On 29th October 1927 a storm blew down a chimney stack which wrecked a store room and boiler house. On 7th November 1927 the Cardigan Golf Club announced plans to sever their links with the hotel and create a new course on Towyn Warren. On 27th May 1932 Mr. D. T. James, J. P., of Gwalia House, Cardigan, purchased the hotel and golf course. The license was transferred from A. P. Harrison to William Glyne Jones. On 23rd March 1934 Tom Jenkins lived here and had assisted the crew of the stricken liner S. S. ‘Herefordshire’ at Cardigan Island. In 1935 the Regional Rally of the Loyal Order of Moose was held here. In May 1935 the property was sold to the Cliff Hotel (Gwbert On Sea) Ltd. – the principal shareholders were Messrs. Evan T. Brazell of Bronwydd House, St. Mary Street, Cardigan, and Arthur Mapstone of No. 6 Priory Street, Cardigan. In July 1935 the license passed to Miss Annie Louise Price. There was a minor fire here on 1st October 1940. In 1940 the license was transferred from Rene Palmer to Margaret Holmes. In 1940-41 Admiral & Mrs. King were resident. In 1942 Major Morton-Smith lived here. On 7th May 1949 manager William Henry Jones of the ‘Cliff Hotel’ died. By December 1950 Mr. & Mrs. Lennie were the proprietors. Mrs. Lennie left in 1954. In December 1954 E. M. Fulcher was the manageress. Mr. J. Con Lewis was the owner in 1965. In October 1970 the property was sold to Mr. T. Leslie Lowe of Penarth. On 1st October 1971 a new ballroom opened here. By 1994 the manager was Mr. P. F. Lowe, M. A.. Peter Lowe sold the property in December 2001 to Llangaddock Estates. In 2006 a major refurbishment saw the demolition of the former mews wing and the building of a new spa, gymnasium and 22 bedrooms. I have been looking at your excellent Cardigan site with great interest, particularly so with regard to the article on the Gwbert Inn. I should mention that the Mary Jones who ran it in the 1870s is my great-great-grandmother. Born Mary Peters in about 1822 she married a William James in 1849 and, on his death at sea, married Samuel Jones in 1856. My great-grandfather Griffith Peters, born in 1842, was the result of an earlier unofficial liaison! Mary died at the Swan Inn, Cardigan, on 15 December 1885. 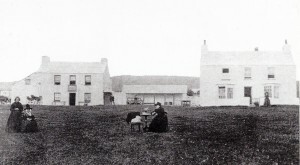 I have two versions of the photograph of the Gwbert Inn that you attribute to 1877. The first, about 12 x 9 inches has at the bottom “Gwbert 40 years ago”; unfortunately this one is in a pretty poor state. The second, in much better condition, is a postcard addressed by someone called Lizzie (I think – it’s a bit hard to be sure) to Mary’s younger daughter Margaret Simmons (née James). The bottom of the photo reads “Gwbert 30 years ago”. My late mother has written on the postcard that the lady in the Welsh hat is her grandmother (i.e. Mary Jones). Peggy would presumably be Mary’s aunt Margaret Peters (c.1806-1887), and Miss Parry must be one or other of the two youngest daughters of Rear-Admiral Webley Parry of Noyadd Trefawr, either Ellen (1812-1892) or Eliza Jane (1817-1894). These two by the way were also the aunts of the David Kedgwing William Henry Webley Parry (1833-1870) whom you mention in your article on the Webley Arms as having leased it out in 1856. I hope that the above is of interest to you. If you would like I should be more than happy to send you a scan of the postcard to see what you make of it. I look forward to seeing your site as it expands in the future. Best wishes for now. Thanks for your notes – very interesting to hear of the family connection and the comments regarding the figures in the picture. I presume the second building is the one mentioned in the 1841 census. There are early references to the Gwbert inn and the nearby Gwbert Cottage. Thanks for getting back to me. As I said, if you would like to give me an address I’d be happy to send you scans of the postcard together with copies of a few other old Cardigan photos I have. As a result of finding a short piece (with photo) about the Cliff Hotel, in a Freemasons’ magazine, I showed it to my son who looked on internet and came across your website. Reading the full history of the hotel – and its misadventures – was of real interest to me. The crowning touch was reading my mother’s name: Elsie Louisa Cornish, who ” ……attended the Ferwig School in 1911″ (quote). My mother is dead many years now, but I clearly recall her own memories of the time when her father (Charles Handford Cornish) managed the Cliff Hotel, as it became. To get to school, Elsie had to have a donkey. This creature would take her about a third of the way, then stop to munch thistles. She would have to walk the rest of the way, and would find the donkey on her way home again, still munching! The school was Welsh-speaking, so Elsie was a bit lonely. She made friends with the grey seals and would sit on the rocks, “whistling them up”. Their heads would bob up from the water. As an adult, my mother told this story in a letter to “Country Life” magazine, in response to an article they had printed. Thank you for all the research you’ve done on Gwbert and the Cliff Hotel. It’s added to an aspect of my own family history. I tripped over this website while searching out “Handford Cornish” on Google where, lo and behold, I find your comment, Janet, and discover that we’re related. Your Mother is my 2nd cousin, 2X removed – and you and I are 3rd cousins, 1X removed. Your Grandfather, Charles Handford Cornish, was the son of Edward Handford Cornish whose sister, Jane Handford Cornish, is my Great Great Grandmother. With Glen’s permission – and if you’d be kind enough to contact me, Janet, I’d love to pick your brain about the Handford Cornish branch of my family tree. Did you know that Edward had ten other siblings and that nine of them had ‘Handford’ as their middle name? Many thanks for making this connection possible, Glen!